In a book, you have the opportunity to share your ideas, knowledge and proven systems and provide value right there. More importantly to you, as a business owner, however, the book is the gateway to tremendous backend sales and endless growth opportunities if you do it right. A full draft of the book can be done in ONE week or less! The book could be ready for publishing in just THREE months! Do NOT WRITE the book! It simply takes too much time. LAUNCH & SELL BEFORE the book is finished! “What the heck is she talking about?”, you might ask yourself. I get it. It sounds completely crazy and I had a hard time believing it too. What we need to do is make sure you understand the origin of common beliefs like “it takes a long time to write a book”, “you need to be a good writer to write a good book”, “you need a publisher to publish a book”, “you need a perfect book in order to be a best-selling author” and “it is very expensive to publish a book”. The answer to your problems is actually simple. You need to self-publish. Did you know that self-publishing is growing by more than 20% annually? That the number of assigned ISBN grew almost 400% in the last 6 years and there are currently registered more than 600.000 self-published books? And did you know, anybody can self-publish a book without establishing a publishing company, without ever printing a single book or without ever writing a word? Did you know, that almost all 6-7-8 figure entrepreneurs published a book? Do you actually think, these boys and girls took out a year of their time to write it? Of cause, they did not. And you don’t need to either. Let me tell you a story to give you some perspective. Ok, not necessary to go back that far. And still. Let’s call him Jack. Jack spend years writing a book this way. He made drafts, threw out whole pieces of paper and rewrote his material several times. But he was lucky! He had a publisher (agents weren’t invented yet) who paid him an advance which allowed him to finish his book though under these, to put it mildly, humble conditions. What was the business model of the publisher these days? Well, in order for us to understand how publishers work, we need first to understand their key assets. Even back then, you could write a book, find an editor and have someone draw some illustrations if needed. However, selling was the problem. Books were a physical product. Physical products are usually sold in physical stores. Stores are distributed at different locations. Stores have limited space for stock. Stores only keep in stock what can sell fast. They order new stock when they have space for new fast selling products. Warehouses need to keep stock to deliver to stores when stores need more stock. Let’s continue the logic. Warehouses are expensive. Keeping many products in sufficient stock level is expensive. Not all products sell. Non-selling products stay in the warehouse. Need big warehouse and help from above to pick the right books to print so stock does not keep growing with new products in too large quantum. So what did publishers do? They paid extreme attention to sale-ability. There needed to be a significant market for the book to be picked by a publisher. The publisher had high initial cost since they had to print a lot of books and store them in expensive warehouses. Ultimately they would have to make sure they got a return on this investment by doing extensive marketing for the “chosen ones”, this also adding to their cost base. Thus, they focused on few but commercially safe(r) books. You see, this model had severe consequences for variation (sorry niche audiences – nothing specifically for you in that strategy). Also, books became expensive and a luxury, not all could afford. Educational books became associated with educational institutions, researchers, and professors. They became authorities within their field. If these guys could have a book published, they had to really know about this topic, right? Must be important knowledge since someone decided to publish it. We still, consciously or not, make this association. You can make that work in your favor to be perceived as an authority in your specific niche and field of expertise. In its nature, the traditional publishing business model has not changed a lot. At some point, agents started to offer their services. There was an opportunity in the market because it was so darn hard to get a publisher. Nowadays, it is just so darn hard to get an agent. Of cause, traditional publishers are increasingly making use of digital channels, but they have a problematic internal structure and mindset that is difficult to break free from. Amazon used to be just another possible sales channel to them. But today, Amazon is a (self) publishing platform just as much as a sales platform. Furthermore, it is one of the worlds biggest search engines for information and full of people with their credit card ready to pay for information. Anybody can publish a book for free and with little hassle. Really, that's hardly worth to write an article about. I have two more important points to make. The first is about opportunity. People read and educate themselves more than ever and in the digital age, they are accustomed to instant access to all they need to know. They have also become content creators themselves producing and publishing short pieces of content on social media on a daily basis. In a market with a lot of people producing content, a lot of people constantly seeking content, and with massive online platforms to connect these two groups (which are not mutually exclusive but actually two sides of the same coin), it is hard to imagine new business models should not occur. There are unfilled needs, and unfulfilled needs tend to attract creative minds willing to do the work and close the gap. At the intersection of the increasing desire to learn and the increasing desire to create, entrepreneurs all over the world are building information products to fill the gap. They offer hungry individuals and companies the opportunity to learn about and get solutions for whatever problem they may have. They tap right into real problems, real pains, and real dreams and deliver solutions and transformations. And here is the thing: You can do the exact same no matter what your field of superior knowledge is! Whatever your field, there is a 99% chance there is a market for it! Jack The Writer didn't have the same level of access to neither information nor had he efficient tools that you do. He had his imagination, conversations, observations and maybe access libraries, magazines or newspapers. He had to use paper, ink and a pen. Later he could type a lot faster using a typewriter, but he still had to rewrite a lot of pages and his toolbox was nowhere near what you have available with just a few clicks. So you should be able to write your book a lot faster right? Wrong. Or somewhat wrong at least. The real obstacle is in your mind. It is about being clear on your messages and getting rid of old beliefs and habits that do not serve your purpose. What do I mean by that? Well, as in any grand leap of effort, you have to believe you can. This implies having knowledge on HOW to work most efficiently. And actually writing your book, is not the most efficient way. Think about this. When you read a book, how fast can you read? Reading is basically the same as speaking the book. It is just usually an internal dialogue between you and a piece of paper. Average readers can read at a pace of 200 words per minute (with a comprehension of 60%), while top 1% of readers can read up to 1.000 words per minute (with a comprehension near 85%). But let's say you are an average reader. 200 words per minute equal 12.000 words per hour. Thus, you can speak 12.000 words per hour. As a norm, books often contain around 250 words per page. This means you can speak around 50 pages per hour! Would you be able to type the same amount in one hour? The average person types around 40 words per minute, equal to 2.400 words per hour, equal to 10 pages per hour. The obvious conclusion here is, that you can speak a book 5 times faster than you can type it. So why would you want to type it when your brains collaboration with your fingers are just slowing you down? Writing from the top of a document is a linear sequence. Our left part of the brain loves working in sequences. However, you want to be creative while creating your book. This requires using your right side of your brain. Therefore, it is highly unlikely you can do creative writing at 2.400 words per hour. Your right part of the brain will stop the left part of the brain from being efficient and interrupt with all kinds of ideas and thoughts. Your left part might say ay and then stop to go look for the place where this idea or thought belong in the sequence. Not super efficient. There is a 50% chance, you are not an average person. There are simply endless interruptions going on. And we still did not even count procrastination and disturbing environmental things going on! How about we assume, you will actually be able to do 20 words? You are welcome to include all the rewriting in that. I feel quite comfortable claiming, you can speak a book 10 times faster than you can write it. Just for these reasons alone. Moving too slow and seeing slow progression is bound to set in motion even further delays. Something else is more important, vacation time is now over, there is a hectic time at work. You invent the reasons, but we can conclude as a fact that it is more than common to spend years writing books only to learn nobody is going to read them. Even with a publisher (you might assume they do marketing for you, but let me tell you that is actually quite limited and lots of authors actually have to pay for that). Thus, I am going to claim 20 times faster, simply because you will have times where you actually for whatever reason won't be writing at all during a longer period of time (and trust me, it will be longer if you type it out instead of speaking it). I think you are still with me. If you are still reading, I think you may have dreamed about publishing a book and gave up just on the thought on how long it would take. You are not alone with this problem! Finally, there are people out there who specialize in each little task involved in creating a book and it is completely unnecessary that you personally do the entire work. That is actually what you pay for if you get the chance to work with a traditional publisher! It is not for the marketing of your book. You PAY through giving up a significant part of your sales and what you get is access to their team of editors, copywriters etc. As a self-publisher, you should also focus on getting the message right too and bring massive value to your readers and clients. Nothing else. 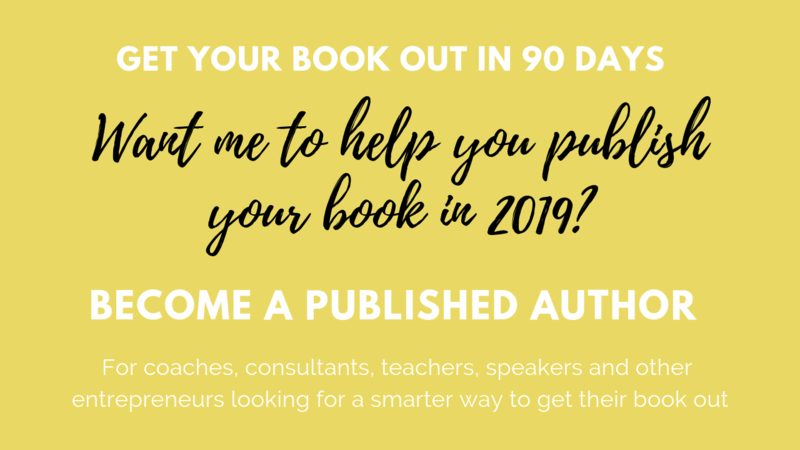 I want to help you get your messages out, have your book published and use it for massive impact in the world and your bank account (hint: you won't actually need to be selling a lot of books but rather much more profitable backend products). So I decided to share with you, how my clients are creating content with amazing value for their customers spending much less time, surpassing the risk of procrastination and bypassing the classic obstacles for completing the task. In my workshops (online and offline), I share what the exact steps are to complete a full first draft of your book in just a week or two. And I show how you are able to get your non-fiction signature book published in just a few months using my proven 10 Step System to Rapid Book Publishing. Go to one of these links and you are one step closer to being a published author! Both programs come in 2 versions: an intensive group program and an exclusive package in which I dive into your content myself. All programs are designed to take you from blank page to published in a few months. Let me know what you think by commenting. Was this useful? Inspiring? Frustrating?